For insulating low-tension fences at corner and end posts and around trees. Notch eliminates need to thread strand of cable or twine through insulator. Use for trees, ends, corners or curves of semi-permanent and temporary fences. Saves time and hassle by being able to slip the conductor through the notch. 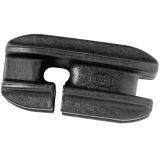 From the closed hole, attach insulator (using rope or wire) to a tree, end or corner T post. Through the notched set of holes, thread fence conductor and terminate at ends, or continue on for corners. Note: If using this insulator for rope or MaxiShock, a P Spring can be tied directly to the insulator prior to fence wire being attached to P spring using rope or wire. 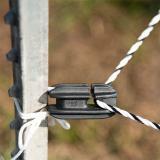 When the fence wire is pulled tight, this insulator will pull away from the post. It is sometimes difficult to get large rope through the notch. To help this, just twist the rope backwards and it will slide in. Useful length of cord for having around the farm. Hang poultry waterers and feeders. Attach wire panels and gates. 6.0mm conductor for electric fences. Black/white color combination is easy for humans and livestock to see. Electrifiable braid conductor preferred by those who wind and unwind twine or polywire frequently. For temporary or portable fences. 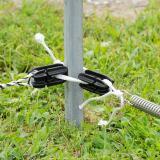 Electric fence conductor for temporary fences. Lightweight and easy to move throughout the field. Twisted cable conductor for electric fences. Thick layer of galvanized coating for years of outdoor use. Super lovely to not have to restring the whole fence. These are sturdy and strong. Very pleased. The notched insulator made putting up the single strand deer fence around my 1/4 acre market garden a snap. When I mow it takes just a minute to loosely coil the twine and pull out the step in posts so I only have to work around the corner t-posts. This is a half baked design in my opinion. Good start, but needs work. The only reason I feel compelled enough to review it is they failed exactly how I expected them to. It is difficult to explain but because of the way that the wire must go into the insulator (horizontal as shown in the picture) the part that attaches to the post is extremely awkward, at best. You have two options, loop it through the given hole which is vertical which causes the insulator to twist, or you have to loop it through the horizontal open hole furthest away from the post. That can cause the insulator to flip down which can pop the wire out and in my cause caused a gate handle to pop out, releasing my goats. I might recommend pairing these with zipties to hold them firmly in place. Simple and last a long time in service. Never had a failure. Great invention. Made stringing the fence so much quicker! I will use only these in the future (other than at rope gates). The regular insulator works best there.